In Los Cabos we get a lot of blues skies (actually 320 days per year to be exact), so sometimes it is a relief for us as Cabo photographers to see a few clouds on a wedding day! I love the moody blues of this image, and the way the clouds, the Sea of Cortes and the surface of the pool combine into one tropical and painterly 'canvas'. Bride Talia, her mother, and 3 bridesmaids were getting ready for her San Jose Mission / Flora Farms wedding at the uber-luxe oceanfront Villa Estero in Puerto Los Cabos. 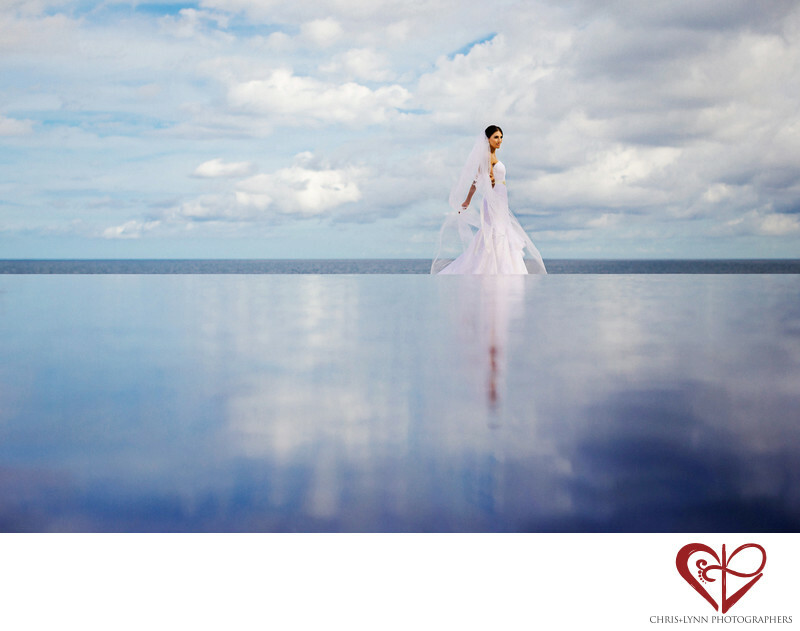 Though the villa is 5700+ square feet, we were drawn outside for the bridal portraits by the stunning Sea of Cortes seascape and the reflective possibilities of the massive infinity pool. When this image was shot, a light breeze disturbed the pool surface & foiled the possibility for a perfect mirror image, but the restless water surface in this case brought a painterly look to the image it otherwise would not have had. We like to have at least an hour to shoot the dress, shoes, stationery, jewelry and other details as well as some photos of the bridal prep such as the final makeup touches and getting into the dress. Two hours gives us time to do creative bridal portraits like this one, as some nice portraits of any bridesmaids and parents present during the bridal prep. To see more from Talia + Sam's Persian destination wedding in Mexico, please see their featured wedding here. Location: Paseo de los Pescadores S/N, Puerto los Cabos, 23403 San José del Cabo, BCS, Mexico. 1/4000; f/2.8; ISO 100; 50.0 mm.